VIDEO OF G11 RIFLE BEING FIRED! There is probably no other weapon concept in modern times that has been more ambitious in scope and breadth than the G11 project. You would expect no other firearms manufacturer to even think about designing something in such uncharted territory as caseless ammunition in a military rifle with select fire capability. Who else but Heckler & Koch is up to the task? 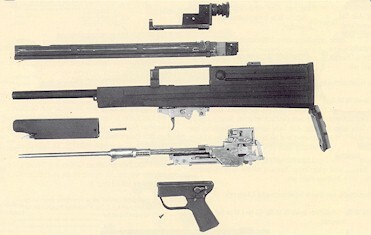 Most of the information presented in this page on the G11 comes from two sources: The Die G11 Story, by Wolfgang Seel, for photographs, and a report called "The Development Status of the Heckler & Koch G11 Rifle with Caseless Ammunition" by Jim Schatz, the principal U.S. contact on the G11 project. There is probably no one on this side of the Atlantic who knows more about the G11 than he. Much of the information on the G11 here comes from that pamphlet. 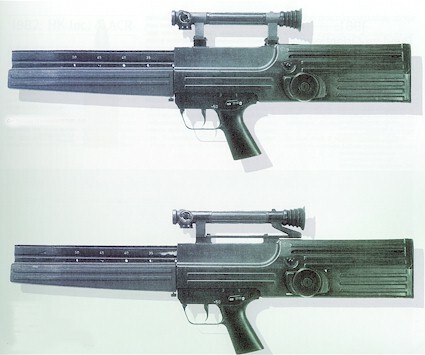 As early as the late 1960s, the West German military noted that even with the superior qualities inherent in the roller locked HK rifles such as the G3 provided only a marginal increase in combat capability over other more conventional rifles available worldwide. Full performance even under adverse conditions. High hit probability in three round burst. Effective range without sight adjustment because of flat trajectory: up to 300m. The major area of concern for the designers was centered around the need to increase the soldier's abilitty to hit targets under realistic battlefield stress. It is well known that combat induced stress degrades the marksmanship ability of a rifleman. Conventional fully automatic fire, even when limited to a burst of a predetermined number of rounds, seldom results in more targets hit. 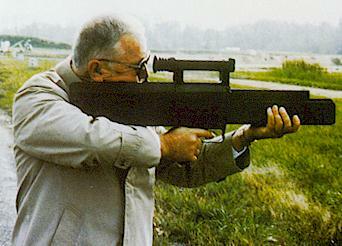 It is generally agreed that if the first round of a burst fired from a conventional assault rifle does not strike the target, the natural rotation of the human torso when subjected to the recoil impulse of weapon will direct the latter rounds of that burst high and to the right (or the left) over the target. A study conducted by the Battelle Institute in Frankfurt, Germany in the early 1960s gave birth to two possible methods to dramatically increase the firer's probability of hitting a target with a single trigger pull. 1. The "Shotgun" Approach-- Launch a large number of projectiles instantaneously. Large cartridge size. Limited combat load. Limited range and penetration capabilities. Launch multiple projectiles simultaneously in a defined pattern at a minimum of 2000 rounds per minute rate of fire. 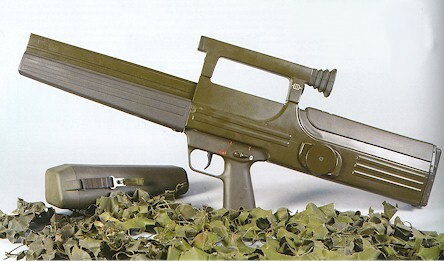 The Salvo Approach was adopted as the design characteristic of the G11. Caseless became necessary to make the 2000 RPM requirement possible. The G11 project started with the uniting of two German companies to attack the project with a team approach. These companies were Heckler & Koch for weapons design and Dynamit Nobel for ammunition design. Together these companies were known as GHGS or Gesellschaft für Hülsenlose Gewehrsysteme. (Corporation for Caseless Rifle Systems). They were joined by German optics maker Hensoldt/Wetzlar for the 1x optical sight that was to become the primary sighting system for the rifle. G11 Caseless rifle inner workings (provided by HKPRO member ToddG, who was lucky enough to visit HK's grey room, and see that the G11 development was so significant as to justify display space in such a significant place). It should be noted that not all of the prototypes have been photographed. That is why the prototype numbers are not consecutive. G11 Prototype 13 (1981) Between 13 and 14 begins the transition to the newer familiar look. While the development of the rifle system was taking place, the development of a new and entirely different cartridge was also under development. 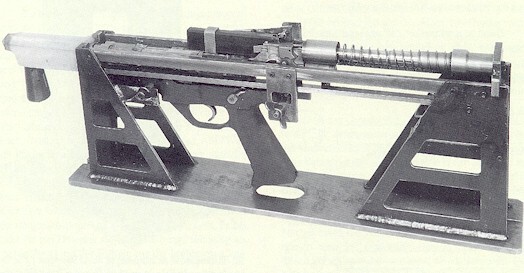 With the determination that the 'salvo' approach was the best for improving troop hit probability, the engineers believed that the best way to achieve higher hit ratios was to develop a rifle that would have a high enough cyclic rate that the rounds would be downrange before the rifle recoiled on the shoulder of the shooter. To achieve this rate of fire would only be possible with caseless ammunition. With caseless, extraction and ejection would be eliminated from the firing sequence, and the mechanism would then be able to operate much faster. The engineers believed that a burst rate of fire in excess of 2000 rounds per minute would be necessary to achieve this desired performance. Below are photographs of some of the various caseless cartridges in their various states of development. 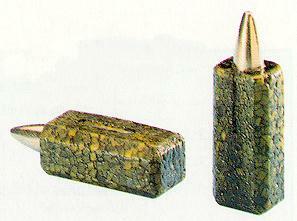 First prototypes of the caseless G11 ammunition from Dynamit Nobel. Caliber 4.3mm. With the first prototype ammunition, the compressed gunpowder is clearly visible. Prototype caseless rounds, caliber 4.9 mm. Prototype rounds 4.7mm x 2, for use with G11 prototype number 6. 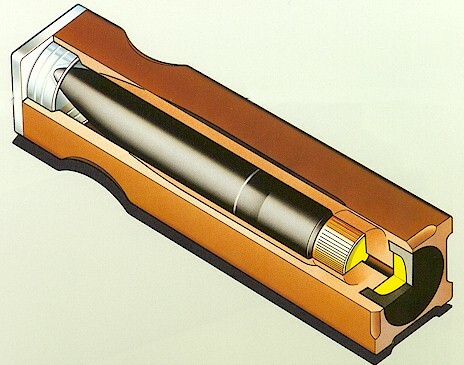 With the HITP cartridge below, one can see the difference visually in the composition of the propellant, and the pace of development that was taking place. HITP Patrone, December, 1981. HITP stands for High Ignition Temperature Propellant, and sought to solve one of the many problems that would be obvious with caseless ammunition, that of cookoff, where the temperature of the chamber is hot enough to fire the round alone. 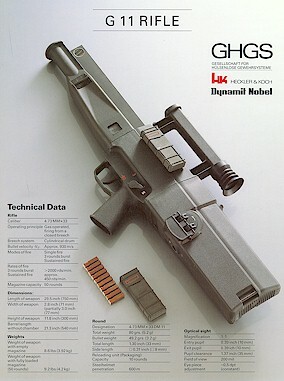 Between 1981 and 1986, the final development of the G11 cartridge configuration appeared to reach finality. 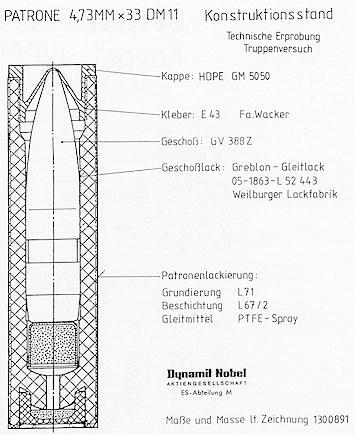 Below is a diagram from Dynamit Nobel of the G11 cartridge 4.73mm x 33. Kappe means Cap, Geschoß means bullet or projectile, Patronenlackierung means cartridge lacquer (necessary for weather and waterproofing). Clearly visible is the primer and booster charge at the base of the bullet. By now, you should have a basic visual reference and an idea of the development of both the rifle and the cartridge. 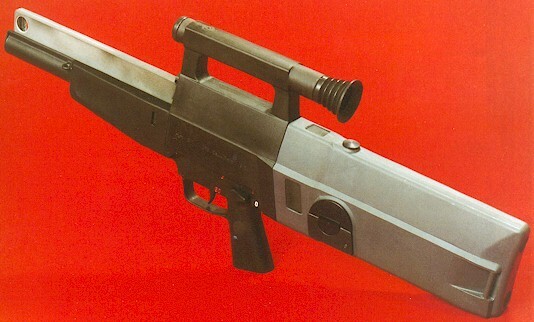 This is no means meant to be complete, but when you realize that the cartridges are fed from above the gun, and are oriented downward until chambering, rotated 90 degrees for firing, and then in the three shot burst position happens at over 2000 rounds per minute, now you might begin to see the scope of the G11 project. 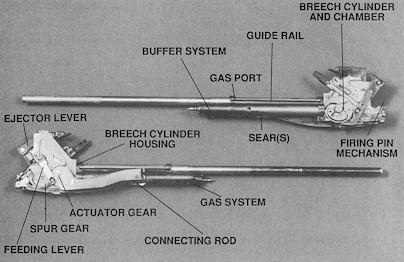 In some of the diagrams below, I will attempt to give you a visual reference as to what is occurring inside the rifle when firing. 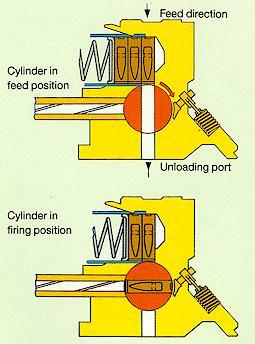 As you can see, the rounds feed from the magazine pointing straight down, and are then turned 90 degrees for firing. In the diagram below, there is an explanation given as to the recoil characteristics. The G11 only has the fast cyclic rate for three round burst. On sustained full automatic, the cyclic rate reverted to a very slow 460 rounds per minute. 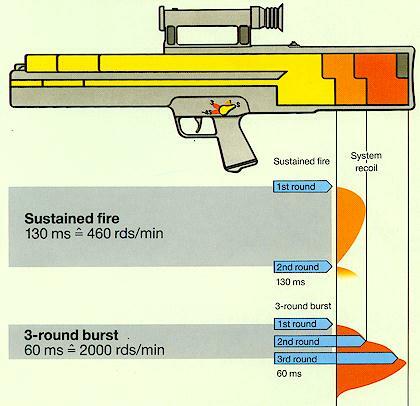 On burst fire the G11 was able to have three rounds out of the gun in about 60 milliseconds, compared to 130 milliseconds between only the first and second shots on full automatic. This meant that before the recoil would cause the rounds to fly off target, (due to the mechanics of recoil on the relationship between the rifle and shoulder of the firer), the three round burst would be on its way, resulting in rather impressive hit probability at even 100m. With any other conventional automatic arm, this was impossible due to the physics involved. The heart of the system. 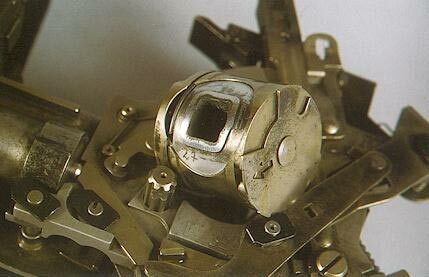 The G11 breech cylinder with chamber, removed for photograph. 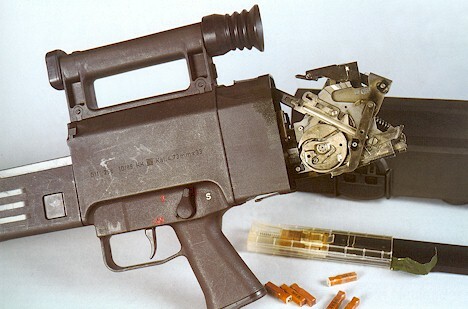 The G11K2 with stripper clip and magazine of 4.73mm x 33 DM11 caseless cartridges. 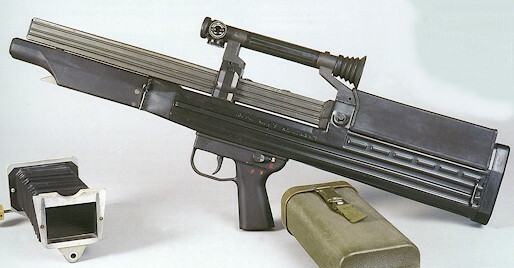 The K2 allowed two additional magazines to be placed on top of the gun, with the center magazine actually feeding the mechanism. The others were spares. 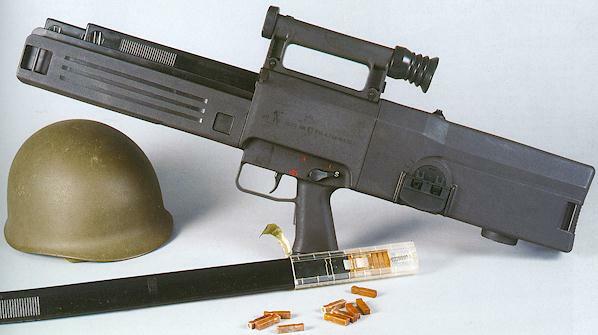 One of the selling points about the G11 and caseless technology was its comparison to conventional weapon systems. 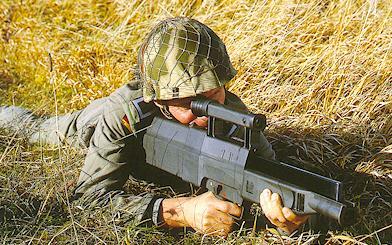 For the German Bundeswehr, still fielding the G3, the comparison should be obvious. 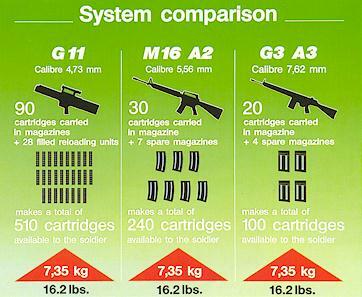 For American purposes the M16 was included for comparison, since the G11 was HK's entry into the Advanced Combat Rifle program in the early 1990s. The ACR program eventually ended with the U.S. government choosing improvements on the M16 system for the forseeable future. One legend meets another: The late Eugene Stoner, designer of several highly successful American small arms systems, including the M16 series, meets the G11 at Aberdeen Proving Ground, MD. Weight with 2 loaded mags: 4.3 kg 9.48 lbs. 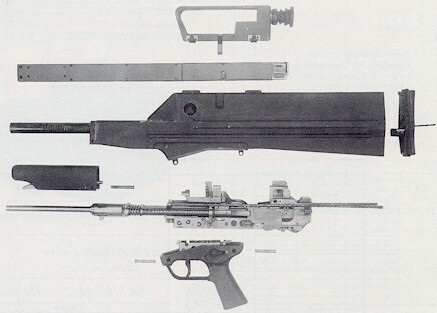 Suffice it to say that a number of factors caused the demise of the G11. The reason most often given is the reunification of Germany, and the attendant lack of desire for the West German government to purchase this new rifle at this uncertain time. Some say it never worked right. No matter what, the G11 represents what the collective minds of a small group of engineers are capable of. It seems to foretell the future of small arms design, which with but a few improvements lately has reached a creative plateau. Could this be the future of small arms? Could caseless become commonplace? Caseless ammunition in the Voere sporting rifle is already a reality and available for the consumer. Or is the G11 doomed to be one of the late, great 'almost' technologies that will be replaced by the amplified light and LASER weapons now being developed? In any case, this page does not do justice with respect to many aspects of the G11 program.